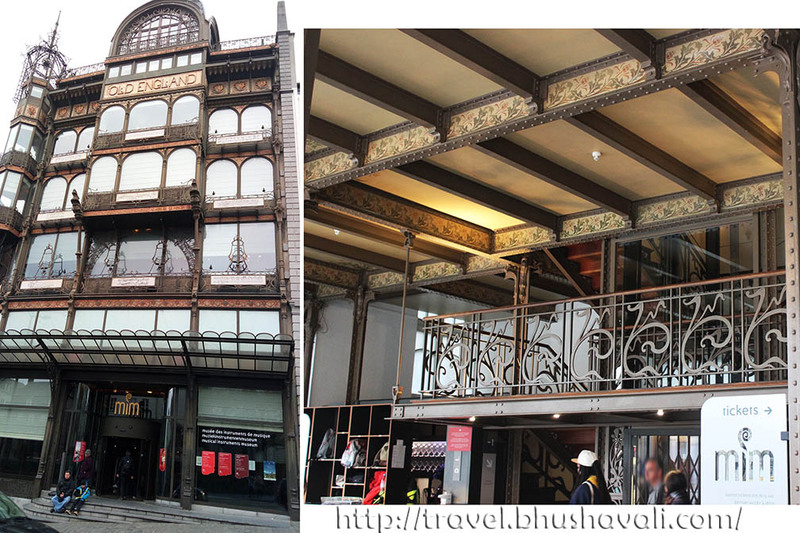 Brussels is filled with several museums and the first batch I went were the Royal Museums of Art & History. There are 4 museum under this of which 3 are functional and 1 is under renovation. Long back when I was here for Flower Carpet, when I was walking from Atomium, I spotted a Japanese Tower, but didn’t manage to explore it as I didn’t have time. Anyways, what I spotted was the Museum of Far East which is one of the 4 museums under MRAH. Currently it’s under renovation. One of the functional 3 is Porte de Hal! It looks like a place straight out of a Disney movie, but in the middle of a city! At the first look, it looks like a castle, however it’s a part of the city wall and this served as a gate. This is the only surviving gate! The first wall was built in 13th C and was 4km long. The second wall was of 8km buily in 14th C. This wall had 7 gates and Portehal was one of those. It was originally 23m high and had a moat all around it. By 17th C the wall ceased to be functional and the gates were used for various purposes including granary, church, prison etc. In 1868, under architect Hendrik Beyaert this became a museum, who gave this place a fairy-tale castle like appearance with neo gothic features! Today it has 4 floors of which the topmost is play area for kids, the 3rd is a temporary exhibition area. The permanent exhibitions are in 1st & 2nd floor. The 1st floor showcases both the history of the Second Wall as well as some armoury. The 2nd floor is all about the various powerful guilds of Belgium that once existed. The view from atop is stunning. The best part - both Koekelberg Basilica and Atomium were visible (on either ends of the above pic!). The Palais du Justice is very close by indeed. Go on a sunny day or atleast, a non-rainy day to enjoy the view. I cancelled my first plan to visit Hallepoort when the weather gave up on me! The 2nd museum under this is the Musical Instruments Museum. This has a rather interesting history. The Museum was originally set up in 1877. The primary reason was because in 1876, Rajah Sourindro Mohun Tagore gifted a 100 musical instruments from India to King Leopold II (yes, this Tagore is related to Rabindranath Tagore but was a few generation before him). Looking at this collection, the famous Belgian musicologist François-Joseph Fétis requested to create a museum of those that he could curate himself, and thus began the existence of this museum. The museum is located inside a fantastic Art Noveau building, which was originally the Old England Departmental store, built in 1899 by Paul Saintenoy. The display is in 4 floors and we began from the topmost. This is dedicated to keyboards beginning from centuries ago to now! The early 16th C Virginals were the most interesting for me, esp. the painted details on it! The most bejeweled one here was an upright piano which was a gift from Queen Marie-Henriette. There were also replica of ancient Greek pottery that were about musical instruments. There were also some wind instruments which were really weird. The Serpent Chandelier of 1790-1810 was the weirdest of them all! Its origins is unknown, but believed to be used in the medieval Gregorian Chants. In the next floor were the western instruments from ages ago to now. The ceramic whistles were total cute! The first floor is the most extensive floor. This has 3 sections - Belgian in centre, European to the left and rest of the world to the left. Here’s where some of the original instruments by Rajah Sourindro Mohun Tagore are displayed. The Tibetian musical instruments made of human bones (a trumpet made of thigh bone) and human skull were particularly intriguing. Jew’s Harp was the English cousin of Indian Morsing! The side blown trumpets of Africa were another interesting thing. The underground floor has some automated musical instruments. 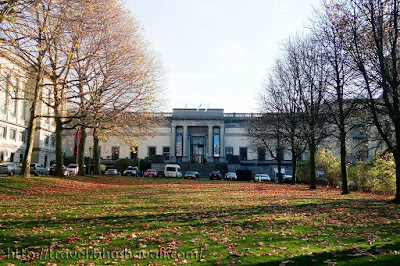 The other museum is the largest in Belgium and one of the largest in Europe called the Cinquantenaire Museum located in the Cinquantenaire park where the Auto World is also located. This has primarily 2 wings - one which is more art oriented and another which is more historically oriented, in multiple levels. I primarily explored the art oriented wing, which began with a section just for heart and went ahead with a section for tapestries where I spent the most time. The best way for me to show around it is with this video! There was also a model loom to explain how tapestry is woven. Other artistic displays included wooden altar sculptures, glass works incl stained glass windows and crockery etc. The archaeology section was fantastic with, the pottery, jewelry, reimagined models of ancient Belgium. There’s also 6 skeletons displayed underground with glass ceiling with arms, jewelry, pottery etc! This was followed by Roman Civilization. The left wing has several sections dedicated to several locations incl India, China, Nepal, Srilanka, Native America etc. Sadly the whole museum is so vast that I didn’t have time to explore this section at all! I just had a peek at India section which has samples of Chola bronzes, Gandhara sculptures and a few more. P.S: Check out here to know what I wore to Porte de Hal, MIM & Cinquantanaire Museums. All 3 have free entry with Brussels Card. All 3 are closed on Mondays. P.S: I was invited by Royal Museums of Art & History to experience their museums for review purpose, however the opinions are my own and this post does not to advertise the product/service. Normally I am not very into museum but there are some that I find interesting and these ones especially the Cinquantenaire museum looks awesome! I could get lost in there and would get bored! The Instrument museum looks fun to. That Serpent chandelier!! There are some really unique musical instruments in this museum! It's good to know that entry is free with the Brussels Card, I'll remember that. As always, some great photos to show the place too. I love roaming around such antiques and history. It is like time travel, the saddest part is the time crunch. I missed visiting this while in Brussels. Glad to see the displays here. So good that they allow photography. I just love museum tours and this one is really interesting. So nice to see you take a tour with your little one. I am particularly intrigued by the archaeology section. Will bookmark this for my visit. Cheers!! What a spectacular trio of museums! I'd definitely head to the musical instrument museum first- I find it so fascinating to see the various forms that objects took before their modern day versions. Plus, instruments made from human bone? I'd have to see them in person to believe it! As Brussels is city of museums, knowing you, this city must be in the list of your favorite one. Knowing that the ancestors of Rabindranath Tagore gifted 100 musical instruments here and they are on display gives a proud feeling. Good to know that this museum also have sections for Asian countries and I would also prefer to see India section. I could spend hours in this museum! Ever since watching the movie 'In Bruges' I've wanted to go here. As you mentioned, the architects there have given the place a fairy-tale look. I'm not majorly into museums but the architecture alone is fascinating and the musical instrument one looks pretty cool. I agree, the Porte de Hal actually looks like the building in the Disney logo! History is always interesting to learn, and this was no exception. I've studied Belgium history, particularly its colonization of the Congo and I am not a fan of King Leopold II due to how brutal and inhumane he was so I wonder why he was gifted 100 musical instruments. When I'm traveling I also happen to skip museums. I hate that! I love seeing your posts about museums because you truly capture the uniqueness of each exhibit. Definitely going to add this to my must-see list. These museums are really gorgeous. The nusocal mejseum is the highlight for me. Those instruments........ And the serpent chandelier got me laughing. I love the history behind these museums and it's a list visit. Your pictures are captivating. I'd watch the video as I've grown much interest in these musuems. I couldn't help drooling for that gold necklace! Omg life previously is so rich! If there is IG during those days, i probably be staying at home, hahaha. The royal feeling is still overflowing in this museum. Ahhhh Belgium is on my bucket list and this looks like my husbands kind of heaven! He loves history and would love to visit this museum. And you weren't kidding- it does look like it is straight out of a Disney movie! I have visited few museums in Brussels, but I have never been to the Porte de Hal. I wonder how could I miss it... Well, next time. You article on Royal Museums of Art & History with its fairy tale castle kind of appearance is excellent. I felt like I am visiting this historic museum. Its great to hear that the walls to this historic city was built in the 13th and 14th centuries. Its said that all except one gate does not exists now. Thank you very much for writing such an amazing article with really good snaps. I love visiting museums especially in Europe as there are a lot of history and culture. This museum is no exception. I love that the architecture is so impressive that it makes it worth visiting in itself!! fantastic. Did not look like one of those boring museums. Really priceless items being displayed. So Staggering and beautiful artifacts kept here. This reminded me of my visit to the History and Art Museum that i saw in Delhi. Its amazing to see every bit of history in one place. Beautiful pictures. Those musical instruments are intense! I can imagine myself lounging in that museum for hours on end. I, too, was a bit intrigued upon seeing those Tibetan instruments made of human bones! I am a die hard fan of music; hence the one I specifically am in love with out of the three is the Musical Instruments Museum. I however also liked your photograph from the top of the Porte de Hal. All the museums have some wonderful collections and I would love to visit them sometime soon. I've been to Belgium but not in Brussels. It's good to know about these museums. I think they are all interesting. I guess it's a good deal getting a Brussels card. Wonderful post. I had no clue Sourindro Mohon Tagore had such far-reaching influence. Thank you for sharing. This is a really interesting museum, and one I'd never thought of visiting before. I've definitely remember it when I'm back in Belgium. A fun fact-filled read for sure! I dont really go to museums while I am traveling especially when its a short trip but I would love to see this one, because of the beautiful city gate ( which looks like a caste :)) And that Musical Instruments part seems so interesting! I love music so I would probably love everything there! Cant wait to visit Belgium one day! I thought I saw an Indian musical instrument while looking at the pictures of the Musical Instruments Museum. Rajah Sourindro Mohun Tagore gifted 100 musical instruments from India to King Leopold II...wow! That is so fascinating. I've been in Brussels a few times but always for very short periods of time, so I've never had enough time to visit its museums. I may be coming back early next year so I will definitely pay a visit to these ones, they look quite interesting! The place is quite beautiful - interesting especially about the forefather of Tagore offering a lot of instruments. Loved that exotic piano picture. There is a similar section and a fairly big one at the Kelkar Museum in Pune. You should visit there and see how gorgeous some of those heritage instruments are -you in particular will love it.